Less than 1 out of every 1,000 cushion diamonds in the world are classified as “Excellent” Polish and Symmetry by the GIA. Every Fire Cushion is “Excellent” for Polish and Symmetry. Most cushion diamonds are classified as “modified”, since they have extra facets around the girdle to retain more weight before the pavilion facets start. The traditional cushion has ½ moon facets arranged below the girdle to retain 15-30% more weight from the rough. The Fire Cushion is graded as “Brilliant” like a round because the pavilion facets are arranged like a round diamond. They start at the girdle which allows for less light leakage and more symmetrically aligned facets for more brilliance. 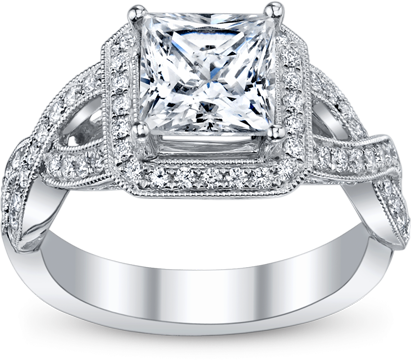 The Fire Cushion will appear 15% larger than a traditional cushion cut diamond. A .90ct Fire Cushion will have a larger diameter than the typical 1.00ct cushion. The Fire Cushion is cut within a 1.05-1 or less ratio, creating a squarer cushion. When a cushion is cut more rectangular, there is more light leakage in the diamond and creates dark spots to the naked eye. The Fire Cushion is the closest fancy shape to an “Ideal Cut” round for light performance. Most cushion diamonds score in the 50-70% for light return. The Fire Cushion is in the 95% (average) range. Each Fire Cushion is accompanied by a GIA lab report, GCAL light performance report, and we will provide a Gemex Light Performance Report. 1. Cut with a patent pending double crown facet structure. 2. Higher crown angle, which allows for the facets to be more symmetrically aligned and to create a smaller table on the diamond. The crown will range from 9.5-13.5%. A typical princess will be 8% or lower, which translates into a larger table and more spread out facets on the crown. 3. Smaller table (surface area) 68% is the maximum, but the average is 65%. Most princess cuts are 70% or greater. 4. Shallower depth percentage. 70.9% is the maximum, 68% is the average. This translates into a larger diameter in comparison to the traditional princess cut diamond. Most princess cuts are an average of 75% or greater. This allows for more weight retention, but smaller diameters. The Fire Mark Princess is cut with small chamfered corners that are not detectable to the naked eye to prevent chipping during setting and wear. The Fire Mark Princess has 65 facets in comparison to a traditional princess which has 50-56. Each Fire Mark Princess will be graded “Excellent” for Polish and Symmetry. Each Fire Mark Princess is accompanied by a GIA lab report, GCAL light performance report, and we will provide a Gemex Light Performance Report. The Fire Mark Princess rivals the “Ideal Cut” round for light performance. Most princess diamonds score in the 45-60% for light return. The Fire Mark Princess averages 98%.